The province of Zeeland has several landparts that are kept apart by rivers and canals. One of the major rivers is the Westerschelde (Scheldt), which is the main waterway to the harbour of Antwerpen in Belgium. This fact made German command decide that the defences in the southern part of Zeeland should be part of AOK 15. So Schouwen-Duiveland and Tholen belonged to WBN. Noordbeveland, Walcheren, Zuidbeveland and Zeeuws-Vlaanderen were placed in AOK 15. Vlissingen (Flushing) was a Verteidigungsbereich. It had a Seefront and a Landfront and even a Kernwerk. Breskens in Zeeuws Vlaanderen was built as a Stützpunktgruppe. 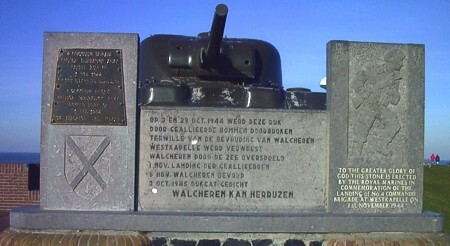 Early 1944 Noordbeveland and Walcheren were declared as the Festung Walcheren. So we also cover the defence line on both the Bevelanden. The allied landings at Vlissingen and Westkapelle were preceeded by the flooding of the island Walcheren in October 1944. At four places the dikes were broken by heavy bombardments. The present landscape still shows the scars of that battle. The everlasting Dutch struggle with the sea led to the destruction of all bunkers which were on top of the dunes, or at the seaside of them. The Landfront however is almost completely as it was ever built. In Breskens and Groede, both in Zeeuws-Vlaanderen, some fine bunkertypes are present, but there was also much demolition. Hans Sakkers and Hans Houterman wrote the masterpiece on this part of the Atlanticwall. Their book is in our Sources. Not many bunkers in Zeeland can be visited freely, most on them are on private property and the dunes are forbidden area. Many farmers consider Sunday as a true day of rest. Besides Henk Adriaanse and Lex Weijerman we use several other guest photographers. 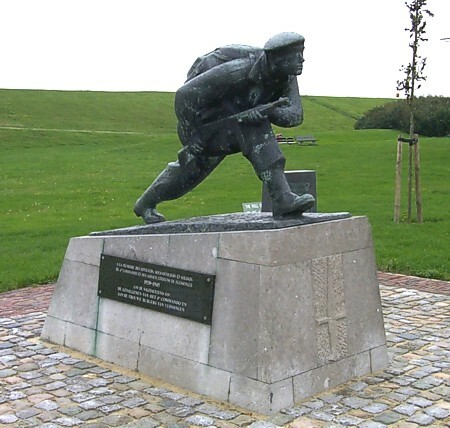 The monument at the dike in Westkapelle. The monument at Uncle Beach in Vlissingen. Both authors of Bunkersite are involved in the foundation Bunkerbehoud which protects and restores bunkers in this area. All pictures shown on Bunkersite are ours or otherwise accounted for. You might consider a visit to the Dutch website of the foundation. It also presents pictures of demolished and hidden bunkers and some rare arial photos.